Spend as much as you can on your locks, it’s cheaper in the long run than having to replace an entire cycle! Where ever possible, when it is not in use, it is best to keep your cycle safely locked and under cover.Storing a cycle in your home may not be that easy or practical, but there are many cycles and tricycles that can be folded in order to store more easily.Some bikes are too big to keep inside your home so would need to live outside in a shed or garage. Even if your cycle is in a garage or shed, it is still important to lock your cycle and insure it.Where there is no shed or garage you might need to use a ground anchor and bike cover of some kind. It is important to protect your cycle from the elements, rain and cold weather can cause metal parts to rust and plastic and rubber to perish, ultimately causing damage to your cycle or making it unsafe to ride. Things to remember when parking and securing your cycle in public;There is little you can do to stop a determined and professional bike thief but you can do a few things to make stealing your cycle harder and less attractive.Secure your cycle in an open, public and well lit area.Where possible secure your cycle to a stand, rack or facilities provided.Tricycles are a little more difficult to secure as the space allocated at stands is not usually very wide.With all cycles it is best to secure your lock to a stand, through the frame and the front wheel, as in the picture below. 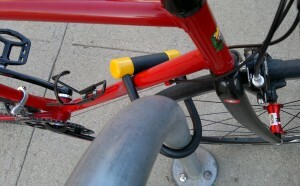 It is also a good idea to use a cable lock on the other wheel/wheels. 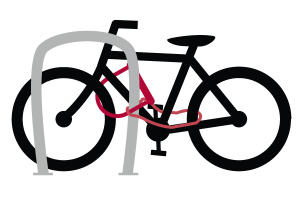 Always be considerate when locking your cycle, make sure you are not accidently locking your cycle to another cycle or blocking access to another cyclist’s cycle or lock. What kind of lock to use? Locks come in a wide variety of types, durability and sizes.D-Lock: D-Locks come in different sizes, and lengths. 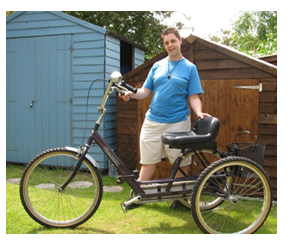 For tricycles and hand cycles you will need a lock with a long shackle/loop. Cable lock: The bigger/thicker the cable lock, the better. Very thin cable locks can be cut easily with a pair of pliers. 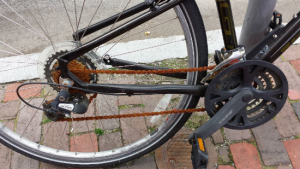 Cable locks are light and easy to carry but they provide very little security if used on their own.This is because they are very easy for bike thieves to break into. Spend as much as you can on your locks, it’s cheaper in the long run than having to replace an entire cycle! It is recommended that you spend around 10-20% of the value of the cycle.Also, avoid any lock that has a round key or a number combination as these are also very easy to break into. As a cyclist you might want to consider two different types of insurance, insurance against theft in the event of your cycle being stolen and Third Party Insurance in the event of you being in a cycling accident that is your fault.Some Home Contents insurance will cover your cycle against theft but this will vary from policy to policy.